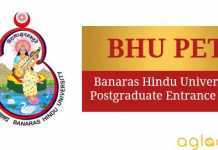 BHU PET 2019– Banaras Hindu University conducts BHU PET for numerous postgraduate courses. Candidates need to appear in BHU PET 2019 if they want to take admission in MBA, M.A., M.Com, MPA etc. After the declaration of BHU PET 2019 Result, candidates need to fill the preference form to select the course, location, seat type etc in order to appear for counseling round. The Counselling Process will be only for those students whose name will appear in the merit list. A noteworthy thing which candidates are required to do is to provide their apt and correct e-mail address/contact number as most of the notification about events related to BHU PET 2019 will be notified on these mediums apart from their official website. To grasp more information about, BHU PET 2019, candidates can go through this article. Latest: The dates for BHU PET 2019 exam has been extended. Scroll down to check the same. Professional Courses: Institute of Medical Sciences, Institute of Agricultural Sciences, Faculty of Visual Arts. Faculty of Performing Arts, Faculty of Education, Faculty of Arts, Faculty of Law, Institute of Science, Mahila Vidyalaya. Special Courses: Faculty of Arts, Faculty of Commerce, Faculty of Social Sciences, Faculty of Law, Institute of Science, Institute of Management Studies, Institute of Agricultural Sciences, Institute of Environment and Sustainable Development. Note: All the courses mentioned above are for 2 years (4 semesters) with an exception of M.Sc in Geophysics (under general courses) and MCA (under professional courses) which are of 3 years (6 semesters) and LLM (under special courses) which is for 1 year (2 semesters). Click Here for more details of the courses offered by BHU. Age Limit: There is no age limit for any course offered under BHU PET 2019. Candidates of all ages are welcome. Eligibility Condition: All the courses offered under BHU PET 2019 will be open for both Male and Female with an exception of M.Sc in Bioinformatics & MA (Master of Education). M.Com- Candidates must have B.Com under 10+2+3 pattern or equivalent with minimum of 50% aggregate marks. M.A.- Candidates must have BA / BA(Hons.) under 10+2+3 pattern or equivalent with minimum of 50% aggregate marks. MCA- Candidates must have BCA degree under 10+2+3 pattern or equivalent with minimum 50% of aggregate marks. M.Sc.- Candidates must have B.Sc. under 10+2+3 pattern or equivalent wth minimum of 50% aggregate marks. MBA- Candidates must have any graduation degree under 10+2+3 pattern or equivalent with minimum of 50% aggregate marks. LLM- Candidates must have at least 3 years LLB after graduation 0r 10+2+3 pattern or 5 year LLB under 10+2+3 pattern. MABM- Candidates must have at least passed 4 years B.Sc. (Ag) or equivalent. MFA – Candidates must have at least BFA degree under 10+2+4 or 10+5 pattern or equivalent with minimum 50% marks. MPA- Candidates must have B.Mus / BPA. Also, candidates cann have BA (Hons.) / B.A. under 10+2+3 pattern with minimum of 50% marks in music practical. Other special exams are also included. M.P.E.d- Candidates must have at least Bachelor of Physical Education or 4 years of Physical EDucation (professional) degree with minimum 50% marks. M.Lib.I.Sc. – Candidates must have any graduation degree under 10+2+3 pattern or or equivalent with minimum 50% marks. M.Ed. – Candidates must have at least 50% marks or equivalent grade in any of the following programmes: B.Ed, B.A. B.Ed., B.Sc. B.Ed., B.El.Ed. D.EL.Ed., with an undergraduate/postgraduate degree with at least 50 % aggregate in each or any equivalent. BHU PET 2019 Application Form are available online. Candidates are required to visit the Entrance Test Portal which www.bhuonline.in in order to fill the application form. Candidates need to fill their personal details, communication details and educational qualification details in the application form. Candidates are required to upload the scanned images of their photograph and signature in the Application Form. Also, it is to be noted that test centers need to be opted in the Application Form only and it is the sole responsibility of the candidates to opt the test center carefully as it can be changed later and it will as it is printed on the BHU PET 2019 Admit Card. Now, last step to submit BHU PET 2019 Application Form is to pay the application Fee. Candidates can use the online payment gateway which are Debit Card / Credit Card / Net Banking. It can be submitted by submitting the challan in any branch of HDFC Bank. Candidates must note that the information given below i based on last year’s information and trends. So, it might change as per the rules and regulations set by the governing authority. As of now, candidates can just have a roundabout idea about the application fee. If candidates wanted to apply for more than one course under PET 2019, the application fee charged from them for the subsequent paper will be given below. Candidates will be able to download the admit card from the BHU Entrance Test Portal which is www.bhuonline.in. It will be allotted to students one week prior to the date of examination. Candidates will have to enter their unique Registration ID in order to download BHU PET 2019 Admit Card. An e-mail or SMS will be sent to the student’s registered e-mail IDs/contact number regarding the availability of the admit card. If a candidate is unable to download the Admit Card till 03 days before the date of the Test, he/she should contact the Office of the Controller of Examinations, BHU, Varanasi. Candidates will have to carry a valid ID Proof with themselves like Aadhar Card/ Passport / Driver’s License/ Any other govt.proof. Also, candidates must ensure that they carry the admit card with themselves to the examination centre as it acts as an entry ticket at the time of examination. Note: The admit card will be made available online only. It will not be dispatched to students by post individually. 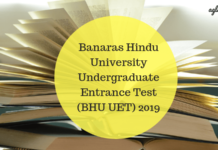 Click here to download Entrance Test Centres for BHU PET 2019. M. A. (Museology) AIHC & Arch. (Ancient Indian History, Culture, and Archaeology), History of Art, History, Sanskrit and other allied subjects as prescribed for postgraduate examination. Section IV: General Knowledge and Current Affairs. Mathematics and Statistics (at 10 + 2 level) and Computer Science at the elementary level. Biology, Chemistry, and Physics (UG level). M.A./M.Sc. (Maths, Statistics), M.Sc. (Physics, Chemistry), M.Sc. (Tech. )- Geophysics, M.Com. Graduate level of the concerned subject. However for M. Sc. (Tech. ), Geophysics the questions will be from Physics and Mathematics (in equal proportions) of graduate level. Section B will have three sub-sections, namely-Life Sciences, Physics and Geology. The candidate shall have to select only one of the three sub-sections of Section-B. M.Sc. in Environmental Sciences (Environmental Technology) (Under Special Courses of Study) Basic Environmental Science (40 MCQs) and Life Sciences, Physical Sciences and Earth Sciences. (80 MCQs). M.Sc. in Statistics and Computing (Special Courses of Study) Statistics of graduate level. M.Sc. in Computational Science and Applications in Signal Processing Basic Statistics (40 MCQs), Mathematics (40 MCQs) and Computer Science (40 MCQs) based on up to Second-year graduate level of Banaras Hindu University. M.Sc. in Forensic Science (Special Courses of Study) Section A will have 60 MCQs from General Sciences at 10+2 level to test the knowledge of the candidates in fundamentals and 20 MCQs of general nature to test their analytical ability, reasoning, and logical skills. M. Ed. B.Ed. or equivalent course. M. Ed. Special Education (VI) (Under Special Courses of Study) B.Ed. -Special Education V.I. or equivalent course. M.Sc. in Plant Biotechnology (Under Special Courses of Study) Based on B.Sc. (Ag.)/B.Sc. with Biology/ B.Sc. (Biotechnology). M.Tech in Agricultural Engineering (Soil and Water Conservation Engineering)(Under Special Courses of Study) Based on B.Tech (Agricultural Engineering) courses related to Soil Water Conservation Engineering. M.Sc. (Ag.) / M.Sc. (Ag.) in Soil Sciences – Soil and Water Conservation (Under Special Courses of Study) Based on B. Sc. (Ag.) Courses/B.Sc (Hons) Ag. Courses. The question paper of the candidate, answer marked by him/her and the provisional answer key will be uploaded on BHU‟s entrance test portal (www.bhuonline.in) within 05 days of the date of conduct of Test. The candidate can log in the portal and see the provisional answer key. The facility to challenge the provisional Answer Key and questions shall be available for 03 days from the date of upload. The Candidates would be required to pay online a sum of Rs.100/- (one hundred only) as Processing Fee for each question/answer key challenge. The payment of the Processing Fee may be made online only (Debit/Credit Card/ Net Banking). The Processing Fee will be refunded online in the same account (Debit/Credit Card/Net Banking) if the challenge is found correct. 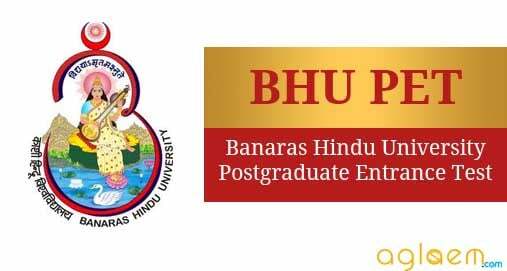 The result for BHU PET 2019 will be displayed on the Entrance Exam Portal which is www.bhuonline.in around 3rd -4th week of June 2019. Also, the marks obtained by the candidates in the entrance test, their overall merit, and merit within the category to which they belong will be mailed at their registered e-mail IDs and will be sent through SMS at their registered mobile number. BHU PET 2019 Counselling will take place after the declaration of results. The candidates will be issued call letter so as to appear in the Counselling Process. Only those candidates will be called for counseling whose name will appear in the merit list. Candidates will be required to contact the Counseling Centre/Venue Incharge and mark your attendance by signing the attendance sheet available with the Counseling Centre Incharge and have to carry certain documents with themselves. Candidates tend to follow some norms or a set procedure in order to take admission by giving BHU PET 2019. Candidates can check the admission procedure prior and after giving BHU PET 2019 Examination. It is obvious that a candidate will be granted the admission only if he/she has satisfied all the eligibility requirements, has appeared in PET and has qualified the entrance test and completed all the prescribed formalities required to take admission. The admission will be made strictly on the basis of Merit Index in the PET, Availability of seats in a particular course. Candidates must also keep in mind that there will no postal dispatch of the call letter. The number of call letters will be nearly two – four times the number of seats available in the course. The admission will be strictly based on the merit index obtained in the Entrance Test. The actual admission process will begin after the declaration of PET Results. The admission will be done by the Admission Committees of the respective departments. The head of the Department / Coordinator will issue the electronic call letters to the candidates in order to appear for counseling. 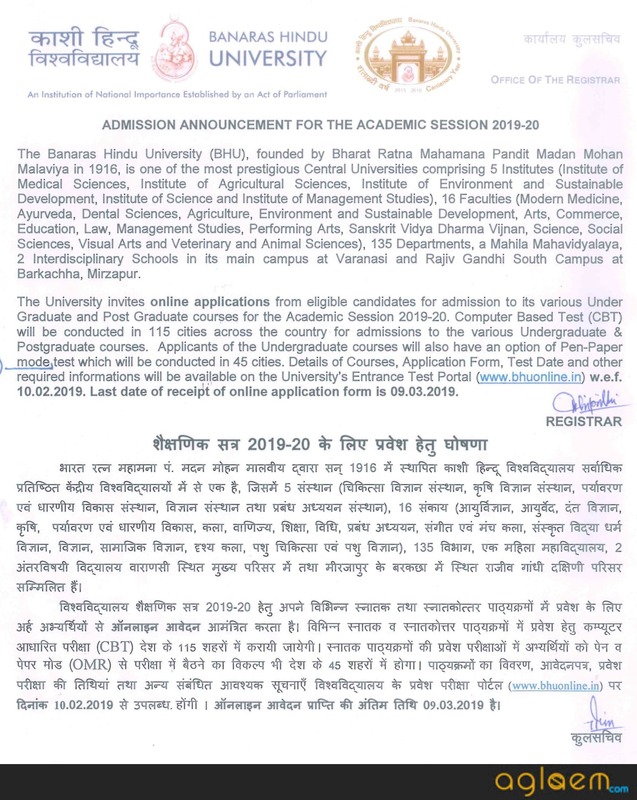 The call letter will be will be made available on the Entrance Test Portal which is www.bhuonline.in and may log in on the portal in order to download the call letter. The information on the issue of Call Letter will be sent to the candidate’s registered e-mail IDs / Mobile Numbers which is why it is advised to candidates to give correct e-mail address / mobile number. Other Backward Classes (OBC): Candidates belonging to OBC category will be provided 27%. They have to submit self – attested certificates in order to prove that they belong to the respective category. Scheduled Caste / Scheduled Tribe: 15% of the seats will be reserved for SC and 7.5% will be reserved for ST. Candidates belonging to this category too will be required to submit the self – attested certificates stating that they belong to this reserved category. For more detailed information on BHU PET 2019 admissions, download the Information Brochure.